No doubt about it, camping can be fun. But, if you don’t pay attention to safety, your fun camping outing can turn into the camping trip from Hell. What are some of the most important camping safety tips you should know? Plan Ahead. Do your research. Make sure the campground you’ve chosen is a safe one. Make sure there are no current fire dangers. Check out the weather. Any health alerts in the area, such as dangerous bacteria count in the water, or outbreak of any rodent-carrying viruses? Pack the Emergency Kit. Be prepared for cuts, bee stings and allergic reactions. Bring antihistamines, antiseptic, bug sprays and insect repellents, pain relievers, bandages, sunscreen and if possible, a snake-bite kit. An emergency kit should also include the following items: Whistle, flashlight, compass, a small Swiss Army knife, razor blades, tweezers, magnifying glass, sterilized water packets for cleaning wounds, emergency blanket, thermometer, cold pack, and a mirror. A mirror can be helpful when signaling for help. Some people also use a CD. If you can afford them, a pair of night-vision goggles can also be a help in an emergency. Arrive at the Campsite Early. Arriving early, with ample daylight, allows you to examine the entire campsite and set up while there’s still light. Be on the lookout for sharp objects, broken glass, huge ant beds, branches, poison ivy, hazardous terrain and bees. Build your Tent on a Safe Spot. Make sure your tent is flame-resistant and keep it at a safe distance from the campfire. Try to pitch your tent on elevated land so it doesn’t flood in case of rain. In order to keep the bugs out, make sure you close your tent immediately upon entering and leaving. Go Over Safety Issues with Family Members. Make sure family members are aware of poisonous plants in the area. Be sure the children understand that they should never drink from any stream or river, regardless of how clean it may look. Finally, issue each member of your family a whistle for emergency use only. Be Fire Safe. Make sure there are no current fire restrictions before building any fire, and don’t build a fire if there are strong winds. When you do build a fire, keep it in the fire ring, and make sure there are no flammable items near the fire. Do not use heating devices or candles inside the tent. Never leave your campfire unattended, and keep the area clear of leaves and twigs. Before going to bed, make sure the campfire is property put out by drowning it with water. Be Aware of Wild Animals. Be sure to familiarize yourself and your family with safety concerning wild animals. Wild animals have acute senses of smell. Make sure you keep your campsite clean and free of food or garbage which might attract them. It is best to store all food, garbage and strong-smelling items (such as soap or toothpaste) in bear-resistant containers or your vehicle. Keep your sleeping bag and tent completely free of food and food odors, and set up your cooking and eating area at least 100 yards from your tent. Do not go to sleep in the same clothing you cooked in, as even the cooking smells can attract bears and other wild animals. 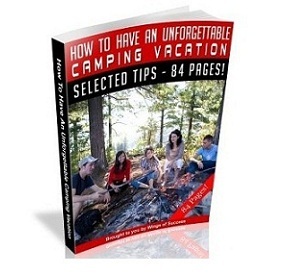 While it may seem like attention to safety takes the fun out of camping, in reality it helps ensure that your camping vacation is a fun time for the whole family. And, isn’t having fun the point of camping?